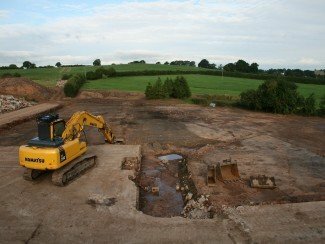 The fine weather continued throughout April enabling the site to completely dry out after the winter as the rear views of the house demonstrate below. 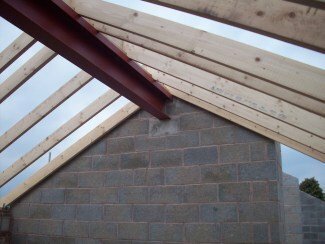 The pool house roof trusses and remaining structural steelwork were placed by crane. 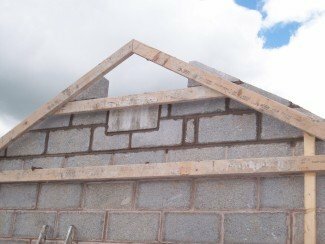 The main house roof and box gutters were also completed during the month. 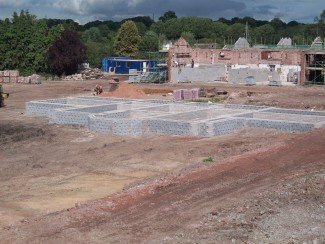 This month proved to be the driest onsite since brickwork commenced last August. 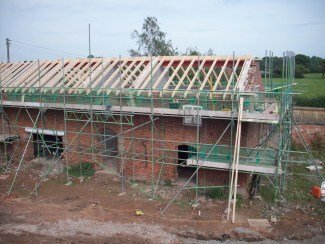 This enabled the main house roof to fully progress including the flat roof section for the skylight as imaged below. 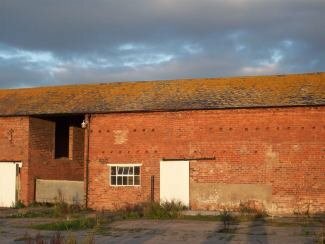 The far reaching views to the west can also be fully appreciated. 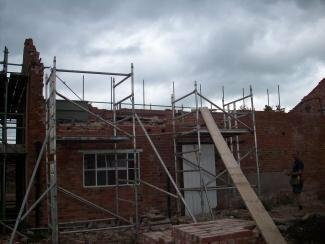 The chimney was also topped out this month ready to receive its Georgian pot. 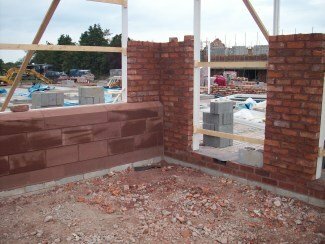 Brickwork continued at a pace to pool house and by the end of March the stone heads had all been placed above the windows and the doors. 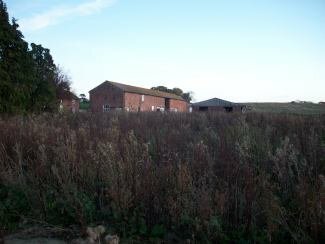 After a further bitterly cold spell in January the pace of works began to pick up and by mid-February the remaining storage barn was demolished to make way for the gym and plant room extension to the pool house. 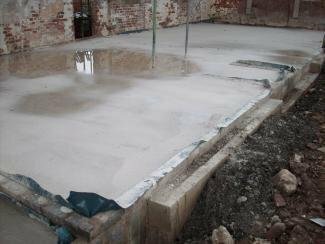 The pool house itself was pumped out to enable the temporary block walls to be constructed to support the beam and block flooring which was subsequently laid at the end of this month. 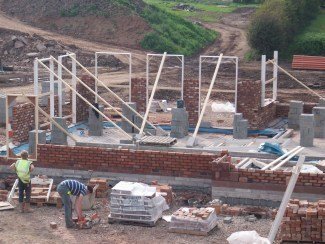 Meanwhile on the main house all brickwork was completed to the third floor and the roof trusses arrived on site. 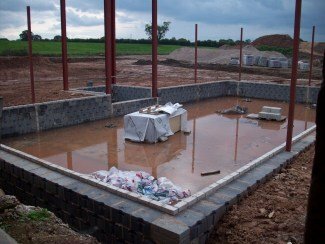 Despite the bitterly cold and inclement weather December brought to the site, surprisingly only 3 days were completely lost and whilst works were suspended on the barn over the winter months the main house progressed by a further 2 scaffold lifts up to second floor joist level which was a great effort considering the bitter temperatures and snow. 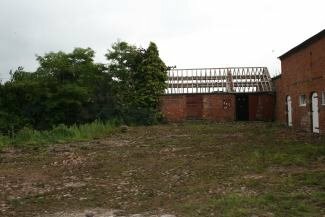 After the Christmas and New Year close down brickwork was complete to the second floor on the main house as well as the joists and caber deck by the middle of the month. 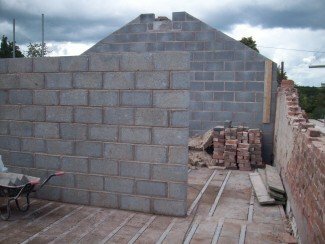 Superstructure, brickwork also commenced to the pool house. 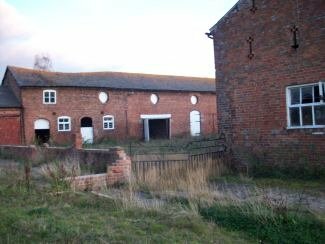 Works continued throughout October to both barns and to the main house. 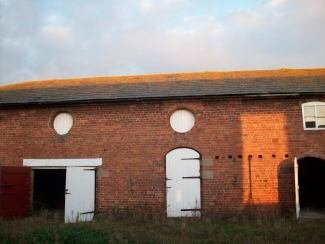 The roadside barns roof was completed, velux roof light installed and the roof reslated from those originally salvaged back in February 2010. 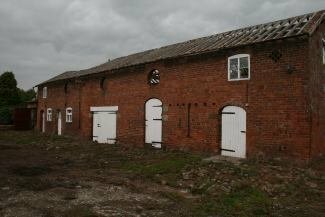 The garage block barn rafters, roof felt and batons were installed during October to enable the structure to be watertight before the onset of winter. 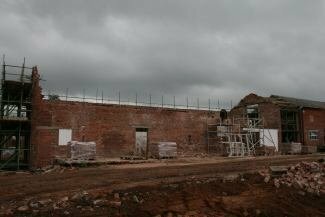 Works on the main house progressed up to first floor joist level despite being hampered a wet October. 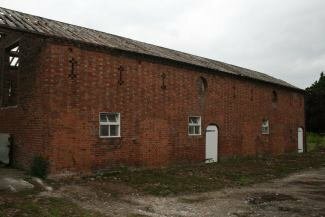 By Novemeber the roadside barn was completely water tight with new aluminium guttering installed, the scaffolding was then dropped. 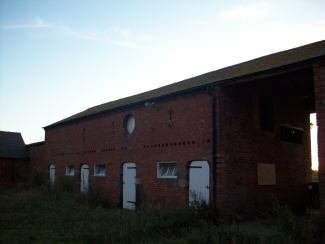 The garage barn block roof was also completed during November including the leadwork for the clock tower upstand. 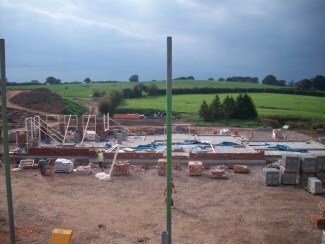 The main house received its first floor joist and beam and block floors whilst the two gangs of brick layers were busy on the full width terrace, retaining walls and piers, front radius walls and dovecote. 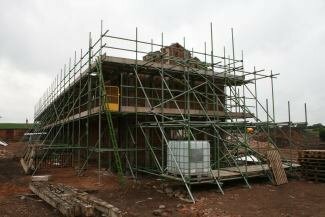 Progress has continued at a fast pace during September, with timbers for the new roof on the stable block are in place. 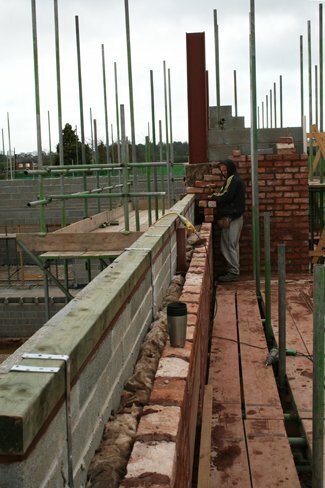 The garage block has received internal blockwork walls on the first floor to form the apartment and offices. 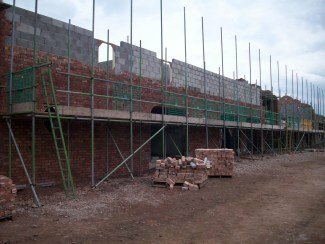 Also facing brickwork (using re-claimed bricks from the original barn elevation) has been completed up to first floor level. 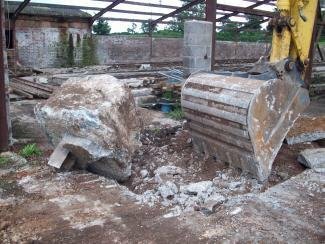 This also included cutting re-claimed stones found on site and now used as garage door hinge blocks. 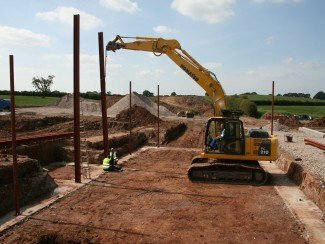 Super-structures have commenced on the main dwelling. 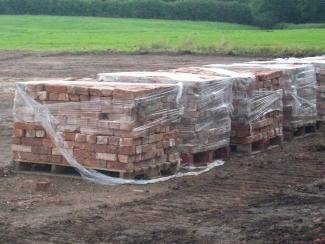 This has seen the first delivery of re-claimed bricks from Blackburn Mill (click here to see article from Lancashire Telegraph), and individual sawn cut stone pieces (Red St Bees) also sourced locally. 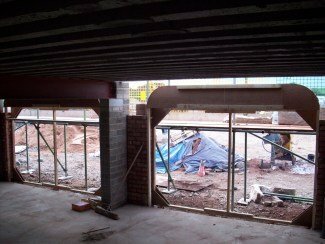 The leisure complex sub-structures are now completed. 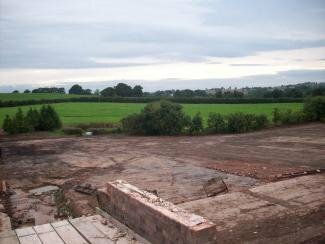 Foundations to the glazed link (from the house to the leisure complex), rear retaining wall, screen wall round to the dovecote and the dovecote itself have all been completed. 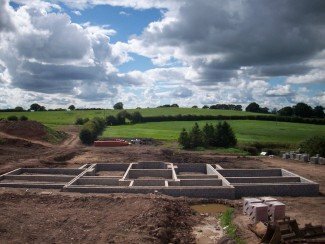 Big progress has been made during August, and the site is now starting to develop. 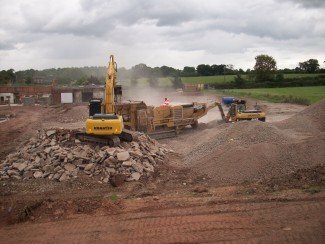 The crusher was on site early in the month, and after only 3 days has left a stockpile of some 3,500tonne of crushed concrete. 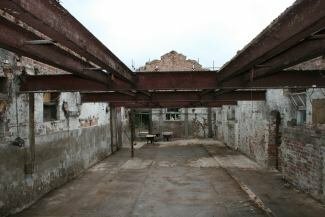 Beam and block first level floors have been installed to the stable block, internal walls continued to joist level and new RSJs fitted ready for the construction of the new roof. 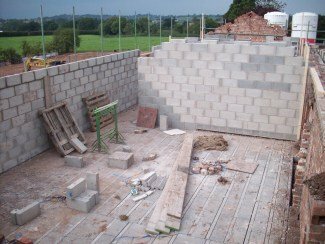 The garage block has also received first floor block and beams, after internal blockwork and steel had been constructed and installed. 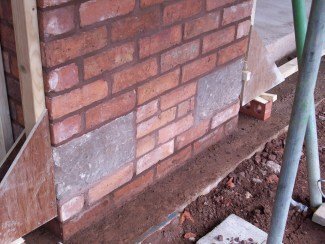 Also the new face brickwork has commenced, with the garage door hinge blocks being cut from existing stone found on site. 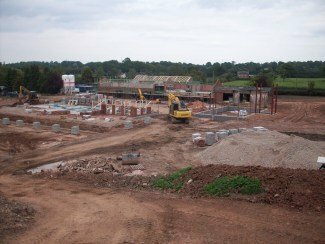 Foundations, sub-structure blockwork and internal drainage have been completed to the main dwelling and the ground floor block and beam floors are currently being installed. 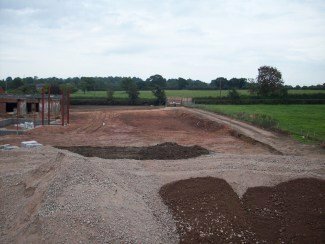 Works to the leisure complex have started; with the foundations being poured and installation of the structural steel it is now ready to receive the sub-structure blockwork. 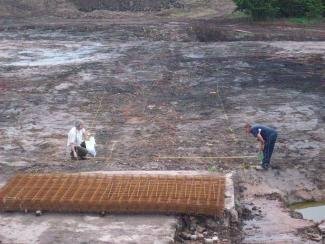 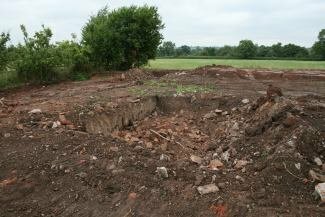 The site strip and breaking out of the concrete hard standings has been completed and stockpile ready for the crusher, which is due in early August. 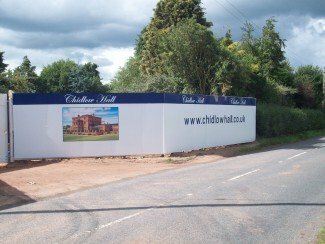 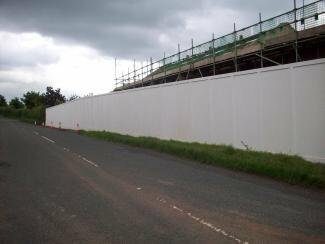 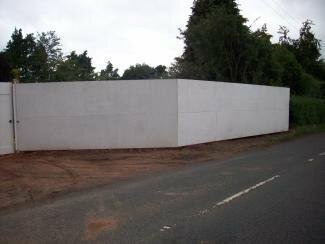 The site hoarding has been constructed, painted and is now awaiting advertisement panels for the site entrance. 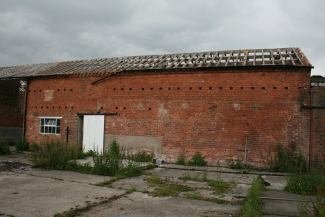 Works to the garage block continue, with half of the block receiving a new concrete floor whist the roof and side elevation brickwork is being dismantles to the other section of this barn. 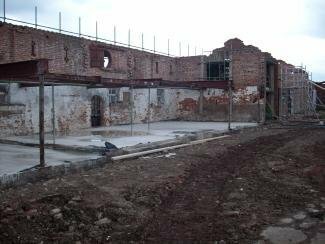 The new internal walls to the first floor of the stable block have been constructed and now await the new first floor beam and block floor. 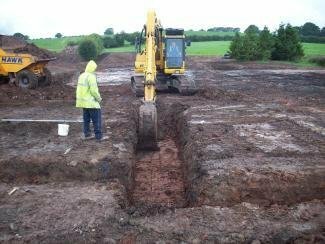 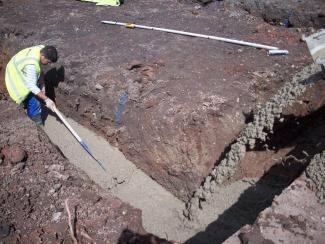 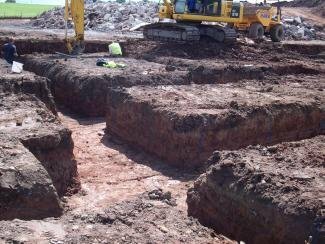 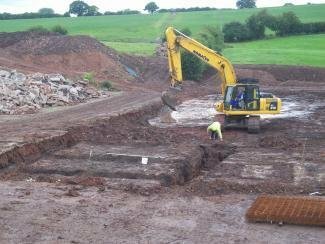 Groundworks have now started on the main dwelling, with the first sections of foundations being excavated and receiving concrete. 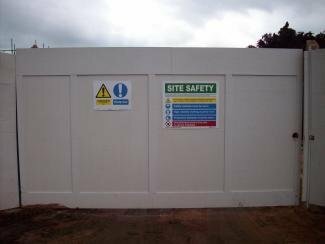 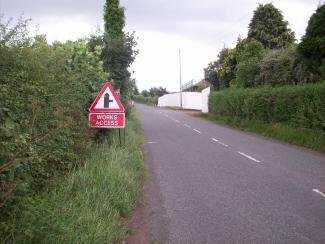 Site establishment and clearence works undertaken. 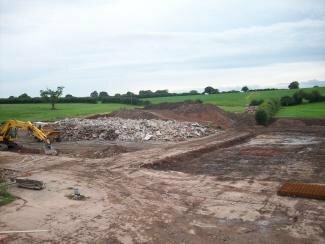 All existing concrete hardstandings are being broken out and stockpiled ready to be crushed and re-used onsite. 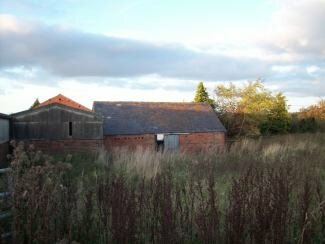 Works have commenced on the outbuildings including breaking out the original floors and re-concreting, removing remainder of roof structures and the the removal of the courtyard barn elevation which needs to be re-built. 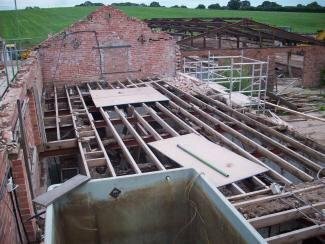 Roof slates, battens and internal first floor joists removed from barns. 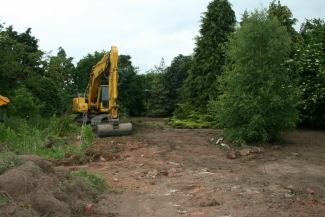 This was carried out to comply with ecological requirements, so as to stop bats nesting prior to construction work commencing. 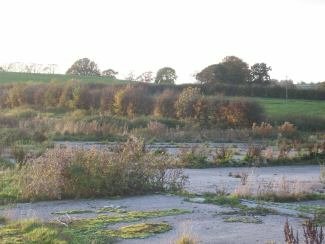 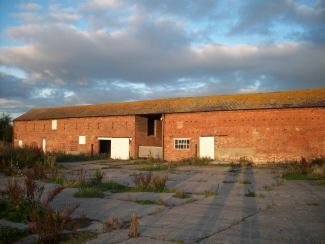 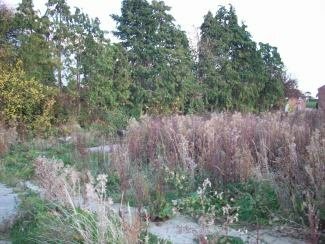 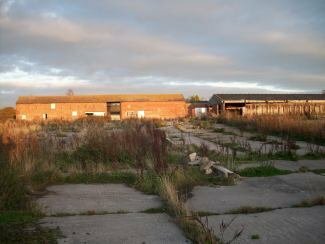 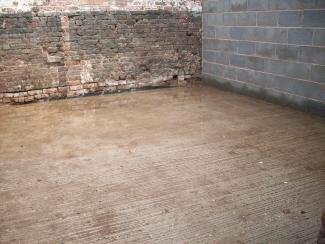 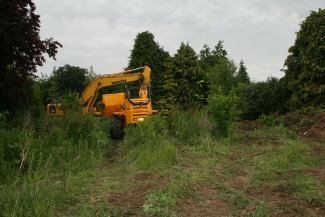 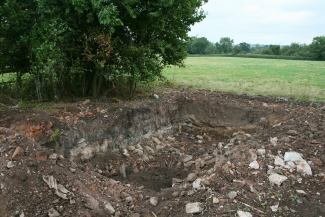 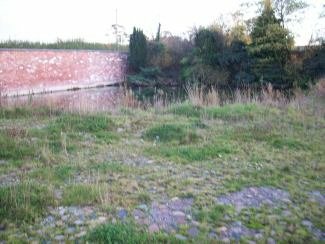 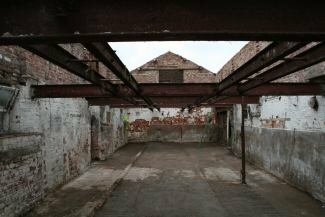 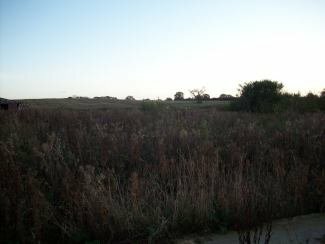 Pictures show site in its original condition, with redundant out buildings and concrete hardstandings where farm sheds once stood..
Website, images and text Copyright 2009 - 2019 East Co Developments Limited.